A tie is an asset to your wardrobe, offering diversity to any outfit. Taking care of your ties, so that they continue to look good, is straightforward and requires only a little extra thought and effort for maximum benefit. Firstly, to preserve your ties, take care when removing them to follow the tie-tying steps in reverse. This is a major step in avoiding tight creases that result from pulling at the tie knot. Storage is the other major factor in maintaining your tie collection. Putting ties away properly is key to maintaining their shape and avoiding creases. Regardless of the type of fabric, ties will crease if not stored properly. So as soon as your tie comes off, hang it on a coat hanger or over the dowel in your closet. Hanging the tie up properly also allows for the creases from the knot to fall out, and keeping it in your wardrobe protects from constant exposure to light that may fade the fabric. 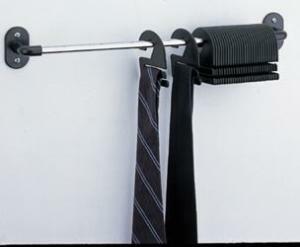 When travelling, it is best to roll ties loosely from the narrow end and position them near the top of the case, rather than under weightier items. Some travellers place rolled ties inside clean socks for added protection. Alternately, keep the tie you are planning to wear rolled softly inside your jacket pocket. For regular travellers, specialty tie cases can also be purchased. Although storing ties properly is your first line of defense, it may not be enough. With regular wearing a tie will tend to develop creases, so it is helpful to know some steps to protect your ties from excessive creases. One way to prevent creases is to avoid wearing the same tie two days in a row, allowing the tie time to regain its shape. When creases do appear, the best cure is steam. The easy way to do this is to hang your tie in the bathroom while you shower. For tougher wrinkles, apply a steam iron over a clean, soft cloth to protect the tie surface, or a handheld steamer. Despite your best efforts stains do occur, usually from food. The sooner you deal with a stain the better the result. If you can immediately blot the stain lightly with cold water it will prevent it from setting. However, water won't work for grease or oil stains. Instead, apply talcum powder to the spot as soon as possible. It will absorb the oily moisture from the fabric. After the powder has had time to absorb the oil and is dry, brush gently with a soft cloth. So, that's all you need to know: careful tie removal, good storage, steam and a quick response to any staining. For an asset that enables you to change the appearance of your shirts and suits time and time again, offering diversity and interest to your wardrobe, it's well worth the effort.